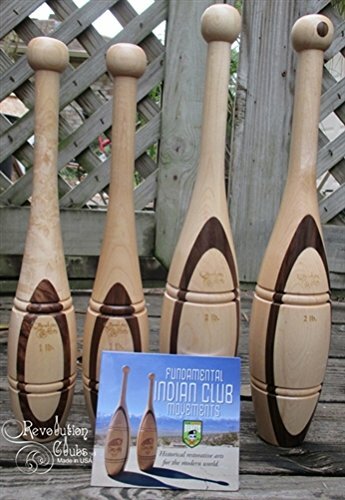 An Introduction set of four (4) Walnut & Maple British Indian Clubs - two 1lb clubs and two 2lb clubs - made in the United States, and the DVD "Fundamental Indian Club Movements" full of great exercises to begin your journey with Indian Club training! Revolution Clubs has designed these clubs to be functional works of art. They are a great addition to your workout routine, as well as a beautiful addition to your workout space. All of our Indian Clubs are American products from start to finish. We choose high quality wood sourced exclusively from sustainable forests in the United States. The clubs are made right here in the USA, and ship from our family owned and operated company near Houston, TX. (2) 1lb two-tone Indian Clubs, 16" long. (2) 2lb two-tone Indian Clubs, 18" long. Layered Walnut & Maple woods. Made in the USA. Includes DVD: Fundamental Indian Club Movements. If you have any questions about this product by Revolution Clubs, contact us by completing and submitting the form below. If you are looking for a specif part number, please include it with your message.